Prospecting methods come and go. 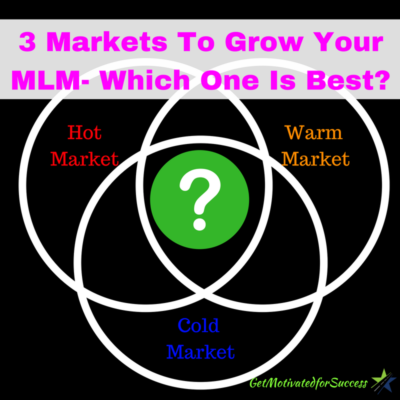 There are always new techniques and ways to prospect that are being taught in the cold market for your MLM or Netowork Marketing business. Even though there are constantly changing methods, some things stay the same, and these 4 Power Prospecting Questions are no exception. While business prospecting, there are 4 specific types of prospecting questions that you should weave into your conversations with your prospects. 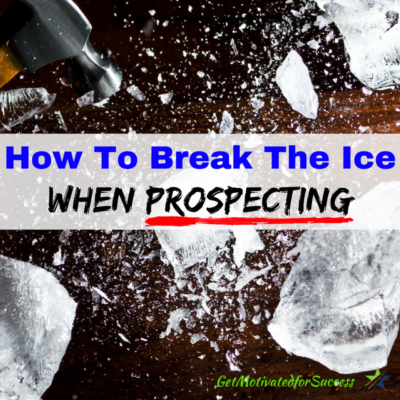 These prospecting tips will help you to connect better, and really get to understand where your prospect is in their current situation. This is key! If you don't know what your prospect needs or wants, how do you know what solution to offer them? It is not always cut and dry. There are times when I don't offer my MLM business opportunity because I know that it is not the solution that the prospect really needs. So many Network Marketers think that their business is for everyone. Yes, everyone can build a Network Marketing business, but Network Marketing is not the solution for every person. If you use these 4 questions in your conversations, your MLM prospecting will be much easier, and you will have more confidence when offering your business opportunity. Watch the video below on the 4 Power Prospecting Questions To Ask and take some notes! Prospecting is still an effective and important aspect of buidling your MLM or Network Marketing business. The better and more confident you can be with your prospecting, the faster and bigger you can build your business. An Additional Prospecting Resource For YOU! Have you ever wanted to talk to a prospect but wasn't sure how to start the conversation? I think we ALL have at some point. 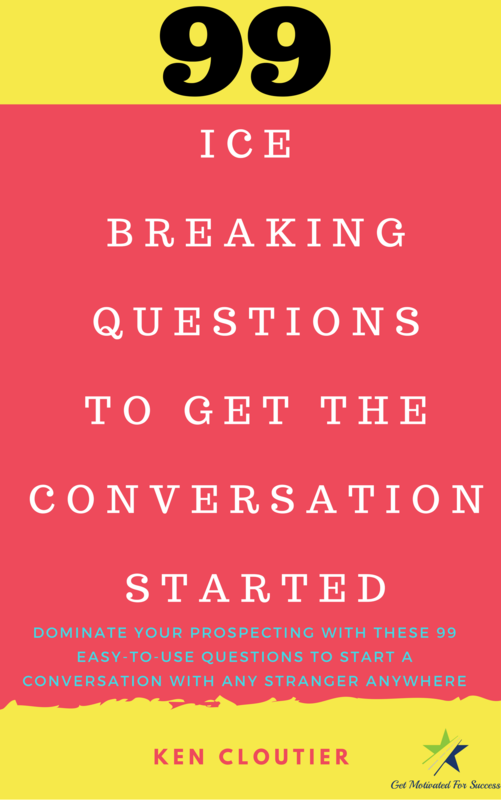 If you would like to become good at starting conversations, I recommend that you grab this E-book; 99 Ice Breaking Questions To Get The Conversation Started. You will learn the single most interesting thing that all prospects have in common, the 4 words to delete from your vocabulary, and the most powerful word in the human language. Plus 99 questions that you can use to strike up a conversation. Get the e-book now! Don't make prospecting for your MLM business complicated. Have fun, and you will get better results as well as gain more and more confidence to build your empire! P.S. 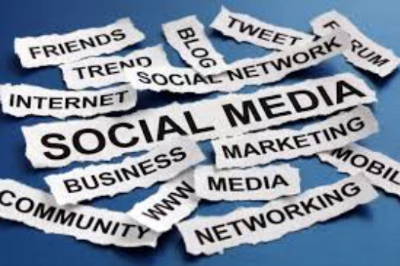 How are you doing with generating leads online? Do you need help with your lead generation overall? Fill in your information below and learn the 7 Secrets to generating leads and making money online that all of the top earners know! 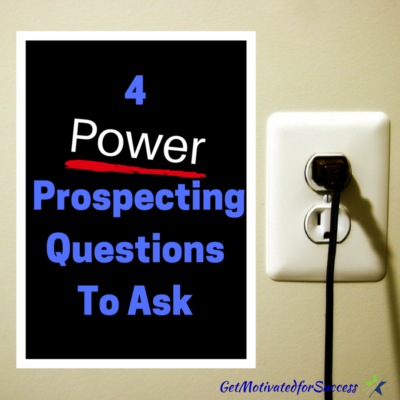 If you enjoyed this post, 4 Power Prospecting Questions To Ask, comment and share! Prospecting for your Network Marketing or MLM business is the building block to the success of your business. For most Network Marketers, mlm prospecting is the least fun thing to do. It takes some guts and courage to walk up to a complete stranger and strike up a conversation. If you want to set a good example for your team, or even have a large team, effective prospecting in network marketing is a must! If you were fortunate enough when you got started, your upline may have shared with you prospecting ideas and tips for Network Marketing. Unfortunately, for most, this was not taught. If you happen to be one of those Network Mareters who were not taught prospecting for Network Marketing, it's not your fault…you are not alone!! 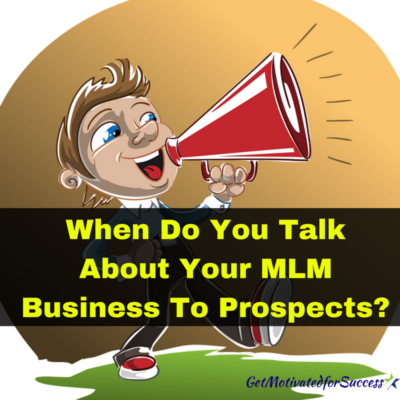 There are several different methods and network marketing prospecting questions that you can use to become proficient in talking to people for your business. In the video below, I talk about prospecting for Network Marketing and offer you some prospecting tips that you can use to break the ice and get the conversation started when meeting people for your business opportunity or products. If you use these tips, you will begin to dominate the prospecting portion of your business! Remember, everything in your MLM or Network Marketing business starts with having people to talk to and share your opportunity with. Get good at prospecting, and your business will grow. 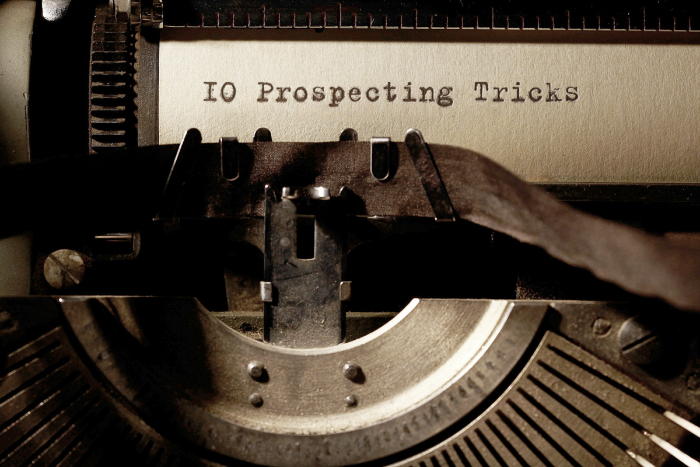 Want to learn the ins and outs of prospecting? Ready to dominate your recruiting and talk to anybody anywhere? This E-Book- 99 Ice Breaking Questions To Get The Conversation Started will do just that!! You will learn some very valuable and proven methods to strike up a conversation and build rapport instantly to meet people, share your opportunity, and make more money for you and your family! P.S. It has been proven that videos significantly increase the know, like, and trust factor with prospects. This means that they will be more likely to join your business or buy your products. 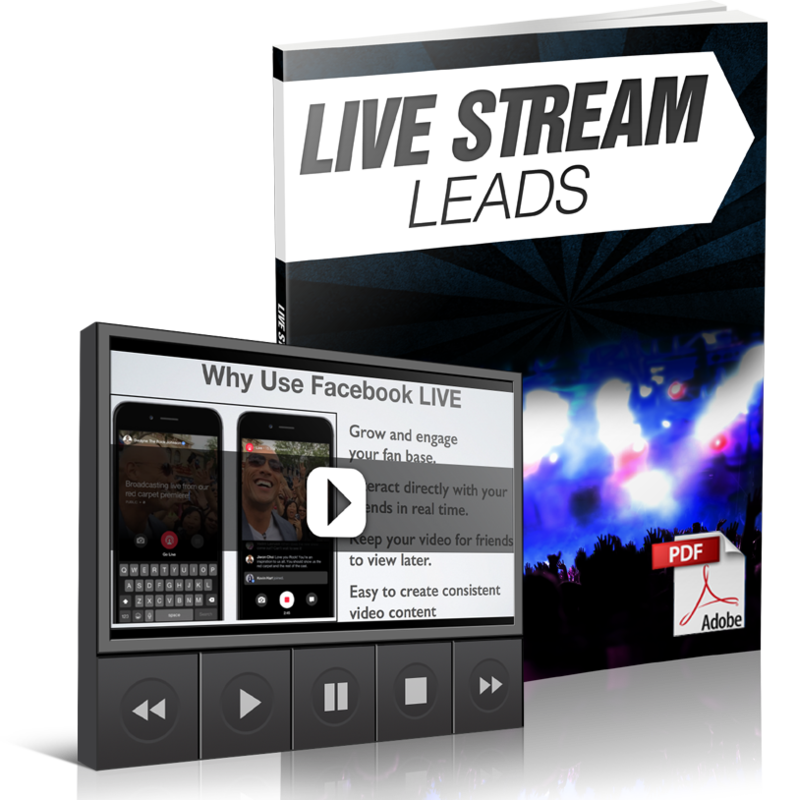 Facebook Live is one of the best tools to build rapport and recruit more people. Check out this FREE training by entering in your information below NOW! 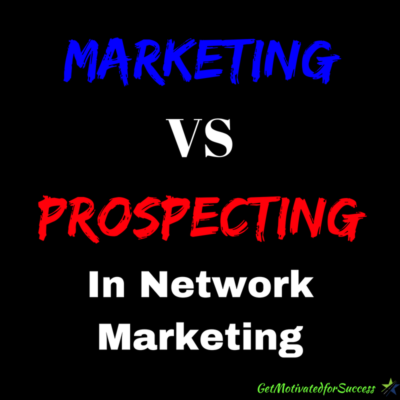 Marketing and prospecting are twisted together when it comes to Network Marketing and MLM. They are used interchangeably when talking about lead generation and how to get marketing leads for your business. The purpose of this post is to educate you about what the difference between marketing and prospecting or prospecting vs lead generation. There is a big difference…like night and day!! If you're trying to get mlm leads for your business and you want people to reach out to you to find out about your opportunity, then you want to use an online lead generation strategy. Here you can get free mlm leads that are literally raising their hands asking you to give them more information. These marketing leads are by far THE best leads that you can get because they are looking for what you have to offer and they came to you to get the information. Prospecting for business opportunity leads is still an effective strategy to use. The difference is, they are not coming to you asking about your service or product. Instead, you are approaching them! Some people have a fear about approaching prospects to talk about their business opportunity, but it is a skill that can be worked on and will be very beneficial to the growth of your business. I will put some resources for you later in this post that can teach you how to approach prospects in the cold market. Marketing- You put out content on the internet providing value and answering the major questions, needs, and wants of your target market. This can include blogs, videos, posts, webinars, etc, and the goal is to have an unnamed person reach out to you for information about your product or service. Prospecting- You go out and approach prospects either online or offline and directly ask them if they are interested in your product or service. Each of these methods work and have a place in your business. For example, marketing generally takes a little bit longer to take effect and see results because you have to build yourself as a brand and become an authority figure where people will feel that you can go to and get their questions or problems solved. Prospecting, on the other hand is more of a hustle! It is a numbers game where you go and talk to as many people as possible! You can get faster results, but the quality of your prospect is not as good because they were not necessarily looking for your product or service. In the video below I explain in more detail what the difference between marketing and prospecting is. Remember, both marketing and prospecting are important activities for the growth of your business. But, in the long run, marketing is a skill that you should learn to really explode your business. Marketing allows you to have massive, unstoppable growth because you can reach so many more people at a much quicker pace. And, they are all targeted people who want what you have to offer! PS: If You Struggle To Sponsor People Into Your Business, This is the Course you Should Get- Total Recruiting Mastery. 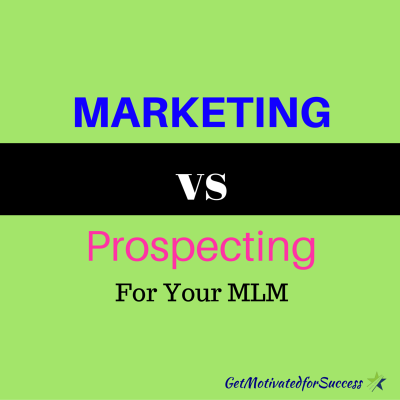 If you enjoyed this post on Marketing vs Prospecting For Your MLM, retweet and comment please! What is a “chicken list?” A chicken list are those individuals who you would like to talk to about your business opportunity, but you are intimidated by them. Usually the people on the chicken list are people who you respect and value their opinion. Furthermore, many times these prospects on your chicken list are doing well financially, and you may feel that they would never want to join your business. I have good news for you! It's not your fault!! You have never been properly taught the MLM tips on how to approach your chicken list, or been given the correct mindset on how to engage with them. Your upline or the mentor that is helping you most likely told you to write down a bunch of names on a piece of paper, which you did. The names that you wrote down were probably people who you are doing better than financially, or you KNOW that they need to make money. The reality is, most of the time it is in the chicken list that lies the true go-getter and ambitious people that you know! That is why you are intimidated and haven't asked them if they are open to your opportunity. Crazy, right? These Network Marketing tips on how to approach your chicken list that I share with you in the video below will help you to approach your chicken list with confidence!! These are very useful MLM tips for beginners that you can share with your team as well. Instill the mindset that I spoke about in the video when approaching your chicken list, and you will have much more success! If you found value, please feel free to comment and share! 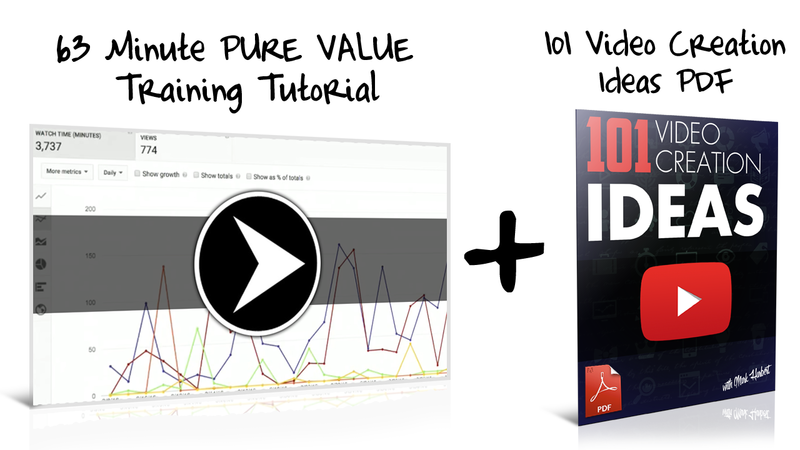 PS: Here is a FREE TRAINING on 10 SIMPLE PROSPECTING TRICKS. Fill in your information below for INSTANT access NOW! 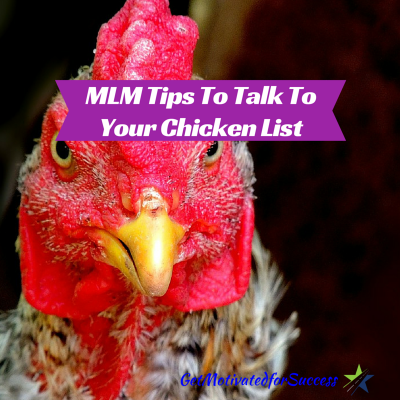 If you enjoyed this post on MLM Tips To Talk To Your Chicken List, Retweet and comment please. Business Prospects are something that every Network Marketer is looking to get more of. In fact, generating leads, sponsoring more reps, and making more money are the three most common challenges that I hear Home Business owners say that they are having. When you think about the perfect prospect for your product or service, who is it? What do they struggle with? What keeps them up at night? How can you help them? These are just some of the questions that you need to answer for yourself in order to start generating more business prospects and Network Marketing leads! The fact is, attracting business prospects to you is not as hard as you think it is. In the video below, I share with you a powerful secret on how you can start to attract business prospects and generate Network Marketing leads for your business (your ideal prospect) through your thoughts! Watch the video and find out how!! The Formula Top Earners Are Using! Your thoughts are very powerful, so why not use them to attract the right people in your target market? If you enjoyed this post on Change Your Thoughts And Attract Business Prospects, Retweet and comment please. Prospecting phone calls are a building block to the growth of your Network Marketing or Home Business. It is one of the main activities that you will use in order to get prospects in front of your business plan. There are many business owners who fear making phone calls to prospects whether they are in their warm or cold market. It's not your fault! We have been conditioned to care about what other people think and don't want to seem “silly” to others. You may have been taught by your business mentor how to use various prospecting techniques or telephone prospecting tips. However, the prospecting tips for making phone calls that I share in the video below are things that most people are not teaching! Watch the video below to find out what you can do to double your appointment setting with a few tweaks! Using these techniques will allow you to schedule and set up more appointments so that you can share your business opportunity to the prospects and leads that you meet!! 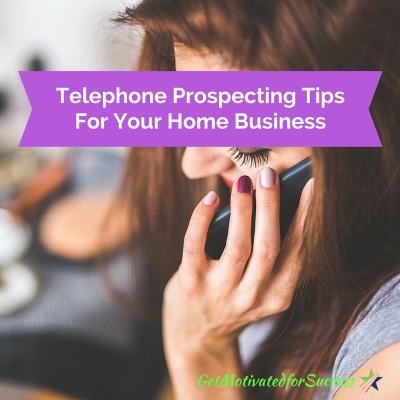 If you enjoyed this post on Telephone Prospecting Tips For Your Home Business, Retweet and comment please. If you will just follow these rules and resist the urge to pitch or spam your business opportunity/products, you will get more engagement, attract prospects to you, and begin to brand yourself! Remember, people join people, not businesses! Did you find value from this? If you did, please comment and share! Do you want the 7-step formula that all Top Earners use to grow their business? Fill in your info below for INSTANT access!